In 2016, a significant progress took place in the technology of surface drilling of blast holes in Poland. Atlas Copco Poland decided to present to its partners the latest available technological tophammer drill solutions. The next stage was importing a SmartROC T40 drill rig equipped with COP 2560+ rock drill, HNS (Hole Navigation System) and a remote control in order to carry out drilling tests for the largest of Polish drilling companies. The purpose of these tests was to demonstrate that although the technological novelties offered by Atlas Copco mean higher initial investment costs, but also faster return on investment due to the improvement of quality and shortening the time of carried out works. They also give greater comfort of work to the operators and blast engineers. Modern equipment enables downloading of the data concerning the deviations of completed holes and the deposit type and quality on ongoing basis in order to use them for for instance the optimisation of further mining plans. One of the partners of Atlas Copco is MAXAM – the world leader in the production of explosives and the largest company on the market of drilling and blasting services in Poland. During a year, MAXAM drills about a million metres of blast holes in Poland. In 2016, the company had 19 Atlas Copco drill rigs and two rigs of other manufacturers. Their fleet is distributed across Poland and provides services to granite, dolomite, sandstone, basalt and melaphyre aggregate quarries, as well as the quarries of limestone for the production of cement and other components for construction chemicals production. In Poland, depending on the particular quarry, walls with thickness of 12 to 28 metres can be found, and the most popular hole diameters are 89, 95 and 102 mm. Getting prepared to the purchase of new drill rigs, MAXAM focused mainly on the possibility of reduction of the total operating costs, underrating at that stage of negotiations the concealed potential of the HNS system and its actual impact on costs. One of the granite quarries of Colas Poland in Rogoznica was selected for the performance of the tests. Two grids of holes with the total length of 2000 m were chosen for the tests, which according to the client should allow for a reliable assessment of the costs of drilling and give the picture of the actual wear of drilling tools. Up until then, the majority of blast holes in Poland were designed using the traditional method, without the consideration of the wall profile or the possibility of verification of the quality of completed holes immediately after drilling. Boretrak system was in use, but due to the time consuming nature of holes sampling and the risk of blocking, its use was very limited. The use of HNS enabled to perfectly maintain the depth level of all drilled holes and to avoid uncontrolled excess drilling, and consequently, the formation of additional edges, the excess of unnecessarily drilled metres, amount of used explosives or consumed time. The drilling parameters sampling during drilling (MWD system) allowed for the generation of a table of the drilled hole bottom deviations in relation to the planned position practically immediately after the completion of the entire grid, which enabled the estimation of its quality and possible adjustments. Additionally, the SmartROC technology proved that holes can be drilled nearly 50% cheaper. Achieved results exceeded the client’s expectations. During the test, average drilling progress of 1.1 m/min. was achieved, while the one achieved so far was circa 0.8 m/min. The fuel consumption during the test was 0.5 litre/meter of hole, while using drill rigs ROC F9C it was from 0.9 to 1.1 litre/meter. The results of the test convinced the client that the machine proposed is worth buying and there are significant premises that the investment will be returned in time and fuel savings. 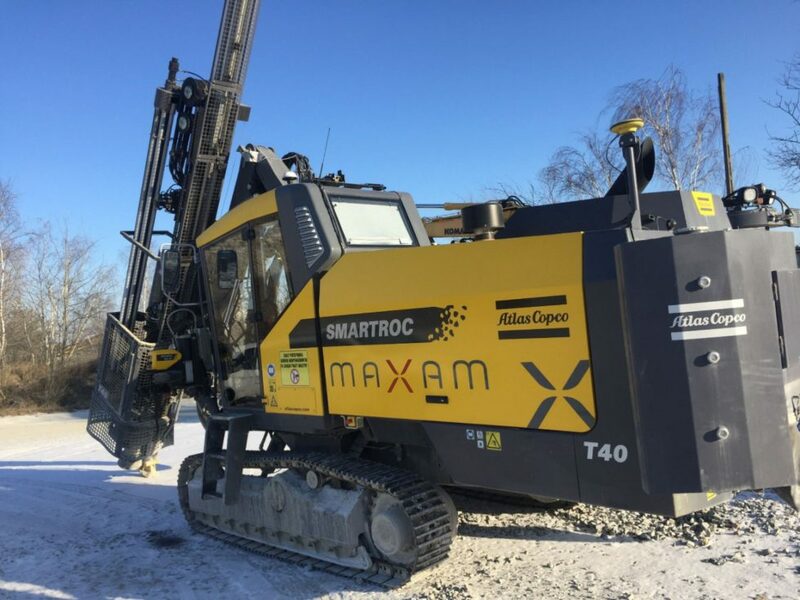 In 2016 Atlas Copco Poland sold six drill rigs from ROC series to MAXAM – 2x SmartROC T40, 1x SmartROC T45 and 3x FlexiROC D50 were delivered. The biggest challenge from the supplier was the needed delivery time, but Atlas Copco managed to live up to the task. The training for new crew was prepared and machines started to perform their job on time. After a few months from its launch, the comprehensive use of the possibilities offered by the purchased drill rigs is starting. Purchased Atlas Copco technology initiated further modernisation at MAXAM, such as the purchase of state-of-the-art 3D scanners. It opened a new stage of the improvement of drilling and blasting works and gave the opportunity to carry out more precise projects with new, greater quality. It should result in the improvement of the blasting works’ safety, better refinement and lower expenditure of auxiliary works, consequently giving a reduction of the total costs of drilling and blasting works. The new investment caused a reduction of the total costs of works by more than 30% (through the reduction of the consumption of fuel and explosives, the lack of additional edges and the drop of seismic seismic vibrations during blasting).